I asked a dozen men (will explain why no women) if they knew what 5 millimeters means in reference to brake pads. None of them knew. Why the survey? 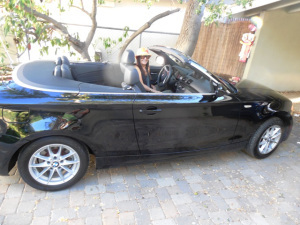 Because I am a woman who went by herself to a Center BMW in Van Nuys and bought a pre-owned certified car. It really doesn’t even matter what model but if you care, a 2011 128i. After handing the finance man my check he whipped out papers for me to sign. I had spent the whole afternoon at the dealership and was tired but I initialed everything. Turns out I initialed that it was okay that the brake pads on the car were worn down to a 5 from a 12.